Spider-Girl #86 will arrive in stores on Wednesday from Marvel Comics. The issue is written by Tom DeFalco, with art and cover by Ron Frenz. "'Family Business,' Part 1 of 3. When an old enemy returns to destroy the Fantastic Five, Spider-Girl must join the children of the original FF on the last line of defense. Guest-starring: Franklin Richards, Kristoff and the man called Nova." Spider-Girl #86 will be 32 pages and will cost $2.99. Spider-Man Unlimited #9 will arrive in stores on Wednesday from Marvel Comics. The issue is written by Christopher Yost and Petar Bridges, with art by Drew Johnson and Cully Hamner and a cover by Salvador Larroca. "Two more tales from the wall-crawler's world! First, Spidey must turn to the Fantastic Four when his ability to stick to walls goes berserk. Then, a bystander to a battle of Spidey's loses his memory!" Spider-Man Unlimited #9 will be 32 pages and will cost $2.99. Rogue #10 will arrive in stores on Wednesday from Marvel Comics. The issue is written by Tony Bedard, with art by Karl Moline and a cover by Scot Eaton. "'Forget-Me-Not.' Rogue and Sunfire take on Lady Deathstrike! But is she the only one behind their recent problems? Part 4 of 6." Rogue #10 will be 32 pages and will cost $2.99. Power Pack #2 will arrive in stores on Wednesday from Marvel Comics. The issue is written by Marc Sumerak, with art and cover by Gurihiru. "'Misadventures in Babysitting,' Alex Power has finally scored a date with the girl of his dreams...too bad his parents are making him babysit his brother and sisters on the same night! Will Alex be able to sneak out for a romantic evening without his super-powered siblings unleashing a whirlwind of inter-dimensional chaos in his absence? Do you really have to ask?" Power Pack #2 will be 32 pages and will cost $2.99. New X-Men #13 will arrive in stores on Wednesday from Marvel Comics. The issue is written by Nunzio DeFilippis and Christina Weir, with art by Paco Medina and a cover by Michael Ryan. "'Campire,' part 1 of 1. The kids at Xavier�s deal with death as they mourn the passing of one of their favorite teachers...but when the emotions start coming out, will the kids start saying some things that might signal the end of New Mutants forever? A 'Wolverine: Agent of S.H.I.E.L.D.' tie-in." New X-Men #13 will be 32 pages and will cost $2.99. A guide to the cool new stuff from this year's BIG SUMMER MOVIES! click on a link above for movie info, movie previews, new product arrivals, ordering and pre-ordering. GLA #2 will arrive in stores on Wednesday from Marvel Comics. The issue is written by Dan Slott, with art and cover by Paul Pelletier. "'Dis-Membership Drive.' With the life-expectancy of hamsters, and an ever-thinning lineup, the GLA is in desperate need of new blood. But what self-respecting super-type would sign up for THIS!? Guest stars galore, including Brother Voodoo, El Aguila, and Captain Ultra. Plus Spider-Man, Wolverine, Daredevil, and all the other spotlight-hogs you can�t get enough of! Oh, and don�t forget, in this issue ANOTHER GLAer DIES! Well... besides Mr. Immortal." GLA #2 will be 32 pages and will cost $2.99. Excalibur #12 will arrive in stores on Wednesday from Marvel Comics. The issue is written by Chris Claremont, with art by Cliff Richards and a cover by Aaron Lopresti. "'Save The Life Of My Child.' Magneto and Professor X face some tough choices with their charge on Genosha, while Callisto and Archangel face a deadly and familiar adversary--Viper!" Excalibur #12 will be 32 pages and will cost $2.99. Daredevil: Redemption #4 will arrive in stores on Wednesday from Marvel Comics. The issue is written by David Hine, with art by Michael Gaydos and a cover by Bill Sienkiewicz. "Matt Murdock's nightly patrols as Daredevil backfire spectacularly in the small, God-fearing town of Redemption, as the fight turns dirty and ;the devil' is accused of a crime he didn�t commit. Battling the public outcry paints a bullseye on Matt's chest -- even as he becomes more and more certain his client, Joel Flood, is not guilty of the gruesome, ritualistic killing that has the townfolk literally up in arms. But time is running out, a horrific secret will be revealed, and the only one who can corroborate Joel's alibi is his mute, paralyzed father, who hasn't spoken in over three years." Daredevil: Redemption #4 will be 32 pages and will cost $2.99. Amazing Fantasy #8 will arrive in stores on Wednesday from Marvel Comics. The issue is written by Fred Van Lente, with art by Leonard Kirk and a cover by James Jean. "'Motherless Country.' The all-new Scorpion follows the only clue to her dark past halfway around the world to exotic Madripoor-- and smack-dab into trouble with the local Triad crime lords! Will her first mission for S.H.I.E.L.D. be her last?" Amazing Fantasy #8 will be 32 pages and will cost $2.99. 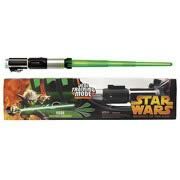 Star Wars - Episode III Revenge of the Sith Yoda Electronic Lightsaber. Glowing replica of Yoda�s lightsaber features electronic �humming� sounds and battle-clash sounds! Activate special Jedi training mode to hear Yoda speak real phrases from the movie! Requires 2 �C� batteries (not included). Ages 4 & up.